Blog about gel nails, nail art and nail treatments. 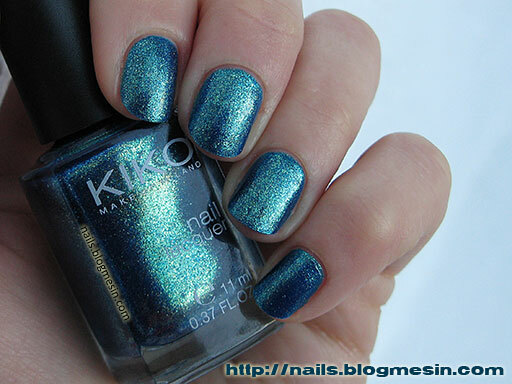 today I have a swatches of KIKO Nail Lacquer – Pearly Blue Peacock (530) for you. As its name suggests this nail colour looks like iridescent peacock feathers. The base is dark blue with loads of shimmer. Depending on the light it changes colour from dark blue to emerald green with a hint of rich violet or golden brown. Unfortunately my camera didn’t quite capture this iridescence. The formula of this polish is great and the the application was smooth. These photos are 3 coats of polish and taken after two days of wear. Welcome to Nails by Rabbit - my little place in the internet where I share my passion for the nail art with you. Visit Rabbit's profile on Pinterest.